A Point of Sale should have easy to use, data driven reports. These reports should be able to report to you on screen, printed printout or to a ASCII file for importing into other software such as a spreadsheet. 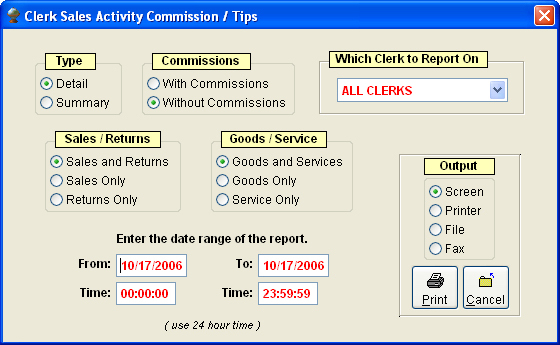 Reports should allow you to analyze any and all data held with-in the Point of Sale system. Your POS should allow you to enter parameters such as date ranges, time of day, category types, etc. to filter your reports in any method you desire. To the right is a sample of a report that is generated from parameters entered by the end-user. A good Point of Sale should have a parameters screen for most reports. POS systems generate a large amount of data. The only way to filter through all of this data is to filer it out with limits on the amount of data shown to you in a report format. Are you interested in creating or maintaining an inventory system in a quick and efficient way? 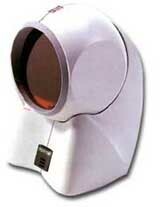 Purchase barcode scanners and barcode printers here today! Barcodes are an integral part of any POS system. Some Point of Sale systems may print barcodes for you or you may have to purchase separate software for the printing of barcodes. Many items come with barcodes on them. A barcode (also bar code) is a machine-readable representation of information in a visual format on a surface. Originally barcodes stored data in the widths and spacing's of printed parallel lines, but today they also come in patterns of dots, concentric circles, and hidden in images. 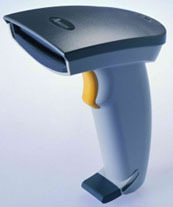 Barcodes can be read by optical scanners called barcode readers or scanned from an image by special software. Barcodes are widely used to implement Auto ID Data Capture (AIDC) systems that improve the speed and accuracy of computer data entry. While traditionally barcode encoding schemes represented only numbers, newer symbologies add new characters such as the uppercase alphabet to the complete ASCII character set and beyond. The drive to encode more information in combination with the space requirements of simple barcodes led to the development of matrix codes (a type of 2D barcode), which do not consist of bars but rather a grid of square cells. Stacked barcodes are a compromise between true 2D barcodes and linear codes, and are formed by taking a traditional linear symbology and placing it in an envelope that allows multiple rows. Practically every item purchased from a grocery store, department store, and mass merchandiser has a barcode on it. This greatly helps in keeping track of the large number of items in a store and also reduces instances of shoplifting (since shoplifters could no longer easily switch price tags from a lower-cost item to a higher-priced one). Since the adoption of barcodes, both consumers and retailers have profited from the savings generated. Rental car companies keep track of their cars by means of barcodes on the car bumper. Airlines track passenger luggage with barcodes, reducing the chance of loss. Recently, researchers have placed tiny barcodes on individual bees to track the insects' mating habits. The movement of nuclear waste can be tracked easily with a bar-code inventory system. More recently, barcodes have even started appearing on humans. Fashion designers stamp barcodes on their models to help coordinate fashion shows. The codes store information about what outfits each model should be wearing and when they are due on the runway. In the late 1990s in Tokyo, there was a fad for temporary barcode shaped tattoos among high school girls. Bar codes have been used to produce portraits. A linear barcode is a binary code (1s and 0s). The lines and spaces are of varying thicknesses and printed in different combinations. To be scanned, there must be accurate printing and adequate contrast between the bars and spaces. Scanners employ various technologies to "read" codes. The two most common are lasers and cameras. Scanners may be fixed position, like most supermarket checkout scanners, or hand-held devices, often used for the taking of inventories. Notwithstanding its inauspicious beginning, the barcode has become a remarkable success, a workhorse in many and varied applications. One of the first successful barcodes, Code 39 developed by Dr. David Allais, is widely used in logistical and defense applications. Code 39 is still in use today, although it is less sophisticated than some of the newer barcodes. Code 128 and Interleaved 2 Million other codes that attained some success in niche markets. The best-known and most widespread use of barcodes has been on consumer products. The Universal Product Code, or U.P.C., is unique because it was developed by the user community. Most technological innovations are first invented and then a need is found for the invention. The U.P.C. is a response to a business need first identified by the US grocery industry in the early 1970s. Believing that automating the grocery checkout process could reduce labor costs, improve inventory control, speed up the process, and improve customer service, six industry associations, representing both product manufacturers and supermarkets, created an industry wide committee of industry leaders. Their two-year effort resulted in the announcement of the Universal Product Code and the U.P.C. barcode symbol on April 1, 1973. The U.P.C. made its first commercial appearance on a package of Wrigley's gum sold in Marsh's Supermarket in Troy, Ohio in June 1974. The mapping between messages and barcodes is called a symbology. The specification of a symbology includes the encoding of the single digits/characters of the message as well as the start and stop markers into bars and space, the size of the quiet zone required to be before and after the barcode as well as the computation of a checksum. Continuous vs. discrete: Characters in continuous symbologies abut, with one character ending with a space and the next beginning with a bar, or vice versa. Characters in discrete symbologies begin and end with bars; the intercharacter space is ignored, as long as it is not wide enough to look like the code ends. Two-width vs. many-width: Bars and spaces in two-width symbologies are wide or narrow; how wide a wide bar is exactly has no significance as long as the symbology requirements for wide bars are adhered to (usually two to three times more wide than a narrow bar). Bars and spaces in many-width symbologies are all multiples of a basic width called the module; most such codes use four widths of 1, 2, 3 and 4 modules. Stacked symbologies consist of a given linear symbology repeated vertically in multiple. There are a large variety of 2-D symbologies. The most common are matrix codes, which feature square or dot-shaped modules arranged on a grid pattern. 2-D symbologies also come in a variety of other visual formats. Aside from circular patterns, there are several 2-D symbologies which employ steganography by hiding an array of different-sized or -shaped modules within a user-specified image (for example, DataGlyph). Linear symbologies are optimized to be read by a laser scanner, which sweeps a beam of light across the barcode in a straight line, reading a slice of the barcode light-dark patterns. Stacked symbologies are also optimized for laser scanning, with the laser making multiple passes across the barcode. 2-D symbologies cannot be read by a laser as there is typically no sweep pattern that can encompass the entire symbol. They must be scanned by a camera capture device. 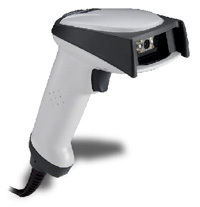 The earliest, and still the cheapest, barcode scanners are built from a fixed light and a single photosensor that is manually "scrubbed" across the barcode. 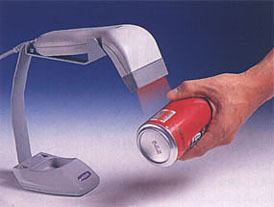 A later design, the "laser scanner," uses a polygonal mirror or galvanometer-mounted mirror to scan a laser across the barcode -- initially only in a straight line, but eventually in complicated patterns so the reader could read barcodes at any angle. In the 1990s some barcode reader manufacturers began working with digital cameras to capture barcodes, both linear and 2D. That technology has since been perfected and now often surpasses laser scanners in performance and reliability. More recently, off-the-shelf digital cameras now have enough resolution to capture both 1D and 2D barcodes. Increasingly companies are looking to incorporate barcode scanning software into cameraphones. However, the camera phone optics are not well suited for standard codes that were designed for industrial dedicated scanners. As a result, new codes are being designed for mobile use such as color code and mCode. Bar code scanners are also relatively low costing and extremely accurate – only about 1/100000 entries will be wrong.